Curved style for a modern day appeal. Built in shelf for holding refreshments. 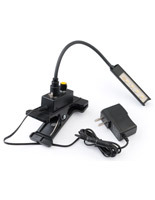 Constructed from steel and has a black textured finish. 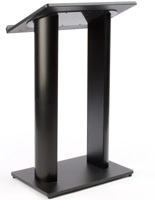 This metal podium can be used in any sized conference room! Each arched speakers stand is constructed with an aluminum body and metal base and reading surface. 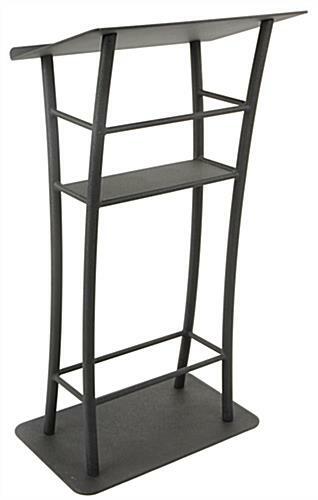 The curved black steel lectern has a textured finish for a modern day appeal. 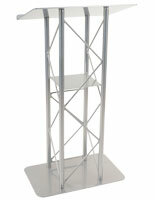 This metal lectern comes fully assembled for use right out of the box! Each curved black steel lectern has a small footprint. 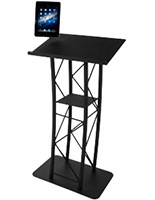 This aluminum stand has a base of just 25”w x 15-3/4”d for easily fitting into small or large lecture halls. 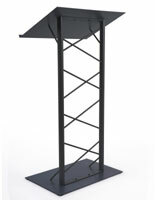 The curved black steel lectern is 47” tall. 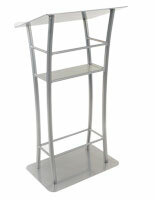 Each metal presentation stand is set at a comfortable height for most users! The arched podium can be used in churches, auditoriums, convention centers, and more! Each speakers stand has a heavy base to prevent the unit from toppling over when bumped. 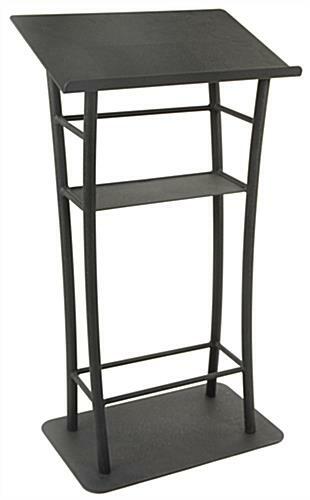 The flat nature of this curved black steel lectern’s base also makes it easy for quickly moving the stand around. This professional podium has (1) shelf. 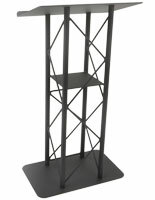 Each curved black steel lectern’s shelf is 17-3/4”w x 7”d. 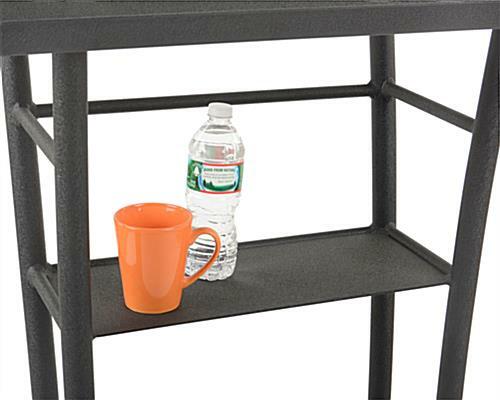 The speaker stand shelf is 29-1/4” up from the floor, making it easy to quickly reach down a grab anything on the shelf. 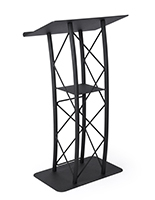 Each curved black steel lectern has a large reading surface 25”w x 15-3/4”d for holding ample meeting notes. 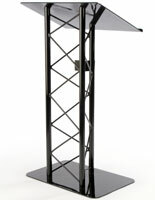 This aluminum podium is designed with a 1-1/8” thick lip for securing presentation papers. 27.8" x 47.0" x 15.8"